2018 is slowly but surely coming to an end, and in regards to a horrific crypto year, it cannot come to a close soon enough for the many crypto traders who are hurting out there. Prices are dipping once again, with the number one cryptocurrency trading well below $3,800. Time to look forward to 2019! The entire cryptocurency universe is currently valued at just over $121 billion, while the top 100 is being dominated by the color red. The number one cryptocurrency BTC is currently trading at $3,775, down -4.56% according to coinmarketcap.com, while maintaining its market dominance over 54.3%. Bitcoin started the day near $4,000, however continued to fall until it reached its current price. XRP the second biggest crypto by market cap, is trading at $0.33, down -4.21% in the past 24 hours, while having a current market cap of $13,6 Billion. XRP registered its lowest price this week, down from nearly $0.40 seven days ago. Ethereum can’t seem to catch a break as its price is down -6.54% today and close to 14% this week. ETH is trading at $103 per coin and has dipped under the $100 psychological threshold a few times already today. Many crypto experts believe that as blockchain becomes more widely adopted, the price and reputation of Ethereum will increase accordingly. 2019 could bring salvation to Ethereum. All the other coins in the Top 10 are all showing losses today, with BCH having lost the most with -10.62% down. Stellar, the current number 4, is down -6.85%, while EOS is showing similar losses of -7.36%. 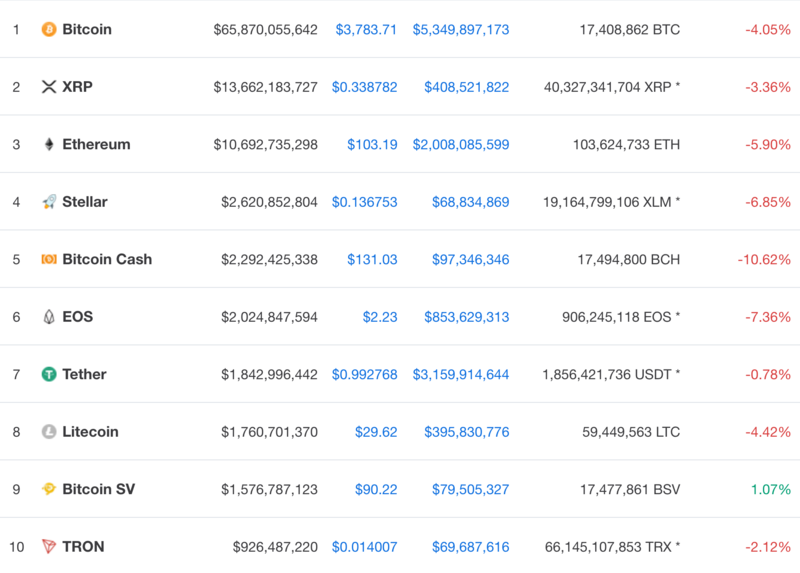 The only top 10 coin that is showing some minor gains is BSV, up 1.07%, currently trading at $90.22. DEX, which currently sits at spot number 72, won the title of ‘Biggest loser of the day’, down -21.94%, and trading at $0.27. The top 5 gainers today are showing nice gains, in an otherwise bleeding market. Twitter user, Crypto Quantamental, points out that the ‘crypto botom’ is near. Maybe Christmas comes early after all?